The Standardized Performance Assessment Lab (SPAL) provides a clinical setting for DMU students to apply their professionalism, communication, organization, clinical reasoning and examination skills without risk to themselves or their patients. The DMU SPAL began as a pilot project during the 1996-97 academic year with 16 patient encounters. Today, SPAL manages nearly 5,000 patient encounters annually. SPAL is used by the Doctor of Osteopathic Medicine (D.O. ), Doctor of Podiatric Medicine (D.P.M. ), Doctor of Physical Therapy (D.P.T. 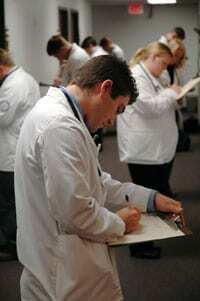 ), Master of Science in Physician Assistant Studies (PA) and the Master’s of Health Care Administration (M.H.A.) programs. Students from all the DMU colleges have multiple SPAL experiences that include a wide variety of clinical presentations. Clinical students work with standardized patients (SPs), local citizens who are hired and trained to portray or simulate a real patient, based on the case being tested. M.H.A. students work through a scenario in a simulated health care setting with individuals trained to portray roles within that setting.